Home » Drupal News » 2010 Google Summer of Code project applications now open! 2010 is here and its time for another Summer of Code, courtesy of Google! For those who don’t know, Summer of Code is an amazing program in which student developers are paid a stipend by Google in exchange for working on open source projects along with mentors from those projects. Drupal has benefited enormously from Summer of Code over the years. Many of our most productive and well-known members are former Summer of Code students, including Drupal 7 core maintainer Angela Byron (webchick), Drupal 6 core maintainer Gábor Hojtsy and many many more. For more information see the Summer of Code FAQ. 2010 marks Drupal’s sixth year being accepted as a mentoring organization. Last year we successfully completed 21 student projects and it would be great to match or even surpass that this year, but there are two things we need to make that happen – Students and Mentors! The Google Summer of Code is Back for 2012! 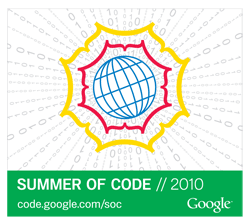 The Google Summer of Code is Back for 2011! Google announces Summer of Code results for 2012 – Drupal gets 13 projects! !